Selections enable you to isolate parts of your images, making it easier to target, adjust or cut out those areas. When working with photographs, these areas are usually quite complex, so attempting to select them with basic selection tools, such as the Lasso, would take ages. This is where Elements’ advanced selection tools – Quick Selection and the Magic Wand – come in. They make selections based on similarities in colour and tone, so they excel at selecting large areas, such as skies, in a few clicks. We’ll show you how to adjust the Magic Wand so that it will select a sky without selecting similar-coloured or -toned pixels in other areas. You’ll then be able to make a selective tonal adjustment to make just the sky look more dramatic, without affecting the rest of the image. It’s similar to the effect of an ND grad (see page 34), with the advantage that anything sticking into the sky above the horizon won’t be darkened. The Magic Wand shares its compartment in the toolbox with the Quick Selection tool and the Selection Brush tool. The Quick Selection tool recognises changes in colour and tone, but it works like a brush, allowing you to paint over areas while the tool seeks out the edges for you. Once you’ve made an intelligent selection using the Quick Selection tool, you can manually add to or subtract from it using the less-intelligent Selection Brush tool. All these tools make a ‘marching ants’ selection marquee that defines the shape of the selection. As well as modifying the marquee’s shape, we’ll show you how to change the softness of the edges to help the selected and adjusted pixels blend more effectively with their unedited neighbours. Open our start image and go to Expert mode. Grab the Magic Wand tool and open the Tool Options. Make sure Contiguous is checked, set the Tolerance to 23 and paint over the clouds and sky to select the entire sky. Click on the Refine Edge button in the Tool Options. Simple adjustments such as Feathering will soften the edges, but there are also more intelligent commands like Edge Detection. Check Smart Radius and drag the Radius to 50px. Set Output To: Selection and click on OK. Now you’ve isolated the sky, you can improve its tones. Add a Levels adjustment layer. The rest of the image will now be masked out. To boost the contrast in the sky, set the black point 20 and the white point to 189. 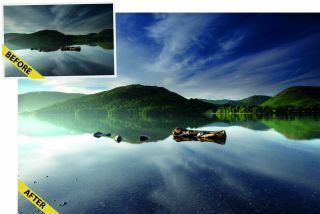 Next, select the ‘Background’ layer, grab the Quick Selection tool and paint over the hills and their reflection. Click Refine Edge, set Radius to 50, and check Smart Radius. Hit OK. Grab the Selection Brush, select Mask, and paint along the edge of the hills reflection with a soft brush. Add a Levels adjustment layer and set the black point to 22, midpoint to 1.28, and white point to 140. With Contiguous checked, the selection is constrained to one area. If it’s unchecked, the tool seeks out similar pixels over the entire image, not just those connected to the point you click. As with any selection tool, hold Shift to add to the selection or Alt to remove areas from the selection. Ctrl-click on the mask thumbnail of the top Levels layer to load the mask as a selection. Cmd/Ctrl-Shift-click on the other mask thumbnail to add it, then go to Select>Inverse to invert it. Add another Levels layer and set the black point to 23, midpoint to 1.07, and white point 233. Highlight the Levels layer that affects the sky. Double-click on the Levels icon on the layer to bring up its settings. Click on the Channel menu and choose Blue. Drag the left side of the Output slider in, to about 15, to add a touch of blue to the darkest parts of the sky.